The State Bank of Vietnam, which is the country's central bank, purchased over US$4 billion in January to add to the country’s foreign exchange reserves, which helped keep forex rates stable, Vietnamese Prime Minister Nguyen Xuan Phuc said at a monthly government meeting in Hanoi on Thursday. The meeting was aimed at evaluating the country’s socio-economic performance in January and reviewing preparations for Tet, the government portal reports. Speaking at the meeting, the PM lauded Vietnam’s positive economic development in the first month of 2019, which saw the consumer price index pick up by only 0.1 percent while forex rates remained stable. “Governor of the State Bank Le Minh Hung has reported to me that in the past month we have purchased over $4 billion in foreign exchange reserves,” Phuc said. “In the current global context, it’s a good thing that the value of the Vietnamese currency has been kept as it is,” he said. The industrial production index rose by nearly eight percent year-on-year in January, while total retail and consumer service revenues also surged by 12.2 percent. However, there was a trade deficit of $800 million in the first month of 2019, with Vietnam generating only $20 billion from exports while spending $20.8 billion importing commodities due to high consumer demands in the month leading up to Tet. Tet, or the Lunar New Year festival, is the biggest public holiday in Vietnam when locals observe the coming of a new year in the lunar calendar, typically falling around late January or early February. Ten thousand new enterprises were established in Vietnam in January, and more than 8,000 defunct firms resumed their operation in the same period, Phuc said. The premier reminded ministries and local governments to stay vigilant as Vietnam’s economic openness is high, leaving the country more susceptible to complicated changes and any development in the global market. Social and economic issues associated with the Tet holiday, such as traffic accidents and price hikes, must be kept under a close watch by relevant government bodies, Phuc stressed. The central bank was asked to manage and control currency and exchange rate policies effectively, and work toward curbing inflation, stabilizing the macro-economy and boosting economic development. 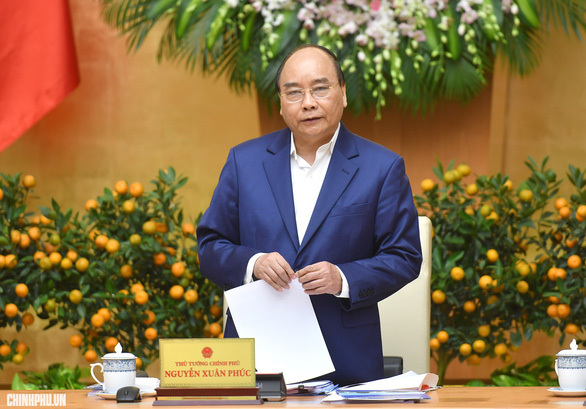 The Ministry of Finance is responsible for further tightening control over financial regulations and conducting inspections and supervision on budget use, PM Phuc said.